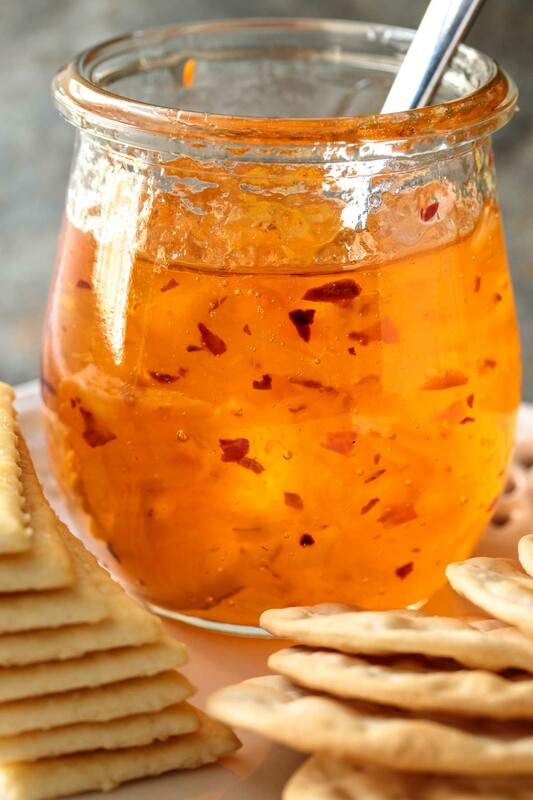 Sweet and spicy, this Pineapple Habanero Pepper Jelly is delicious on cheese trays and makes a wonderful grilling glaze. I have to blame, or maybe a better word is “thank”, Scott for the inspiration for this Pineapple Habanero Pepper Jelly. Yes, “thank” is definitely a better word! We were out grocery shopping several weeks ago, a few days before we were planning to leave town for a six day visit with our daughter and her family in Memphis. Scott spied a display of large, beautiful pineapples for a ridiculously cheap price. He picked one up and placed it in our cart. “But we’re headed to Memphis is just two days,” I said, thinking about all I had to do before our trip. “You’ll figure out something to do with it.” he replied. And that was that. I was already beginning to think about Pineapple Habanero Pepper Jelly as we stood in line at the checkout counter. I’m so happy the pineapple ended up in my cart, as I love having a stash of this delicious Pineapple Habanero Pepper Jelly in my freezer. Yes, I did say freezer – although this is not an official “freezer jam” recipe. Being a bit lazy, I store all of my jams and jellies in the freezer, in lieu of the more traditional hot water bath canning method. Need a quick, easy and super delicious appetizer? 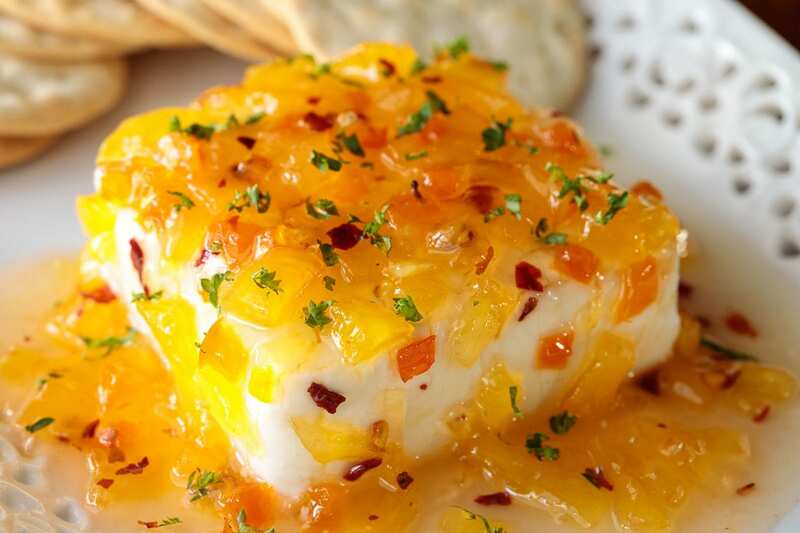 Just spoon this Pineapple Habanero Pepper Jelly over a block of cream cheese or a round of goat cheese. Add a nice selection of crackers and you’ve got a fabulous (and beautiful) appetizer in the blink of an eye. 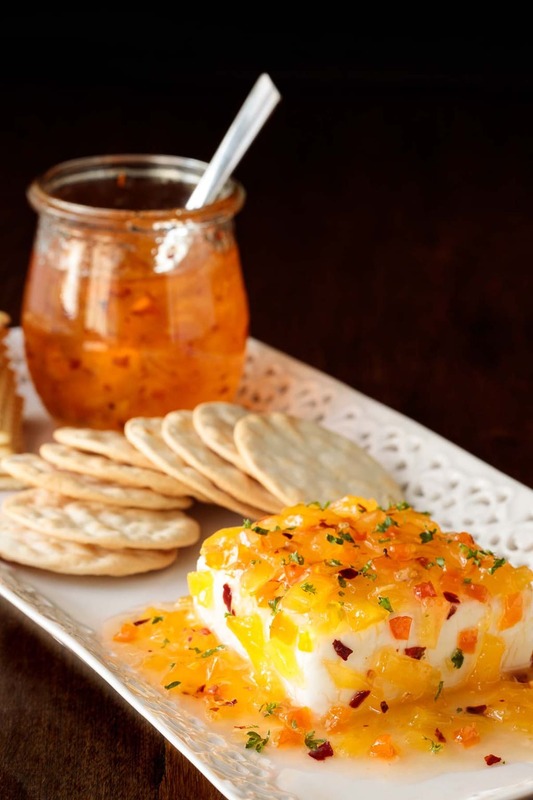 Other than serving over goat cheese or cream cheese (pictured above), there are lots of delicious ways to use pepper jelly. Here are a few ideas. Serve in a small bowl, along with crackers and cheese. 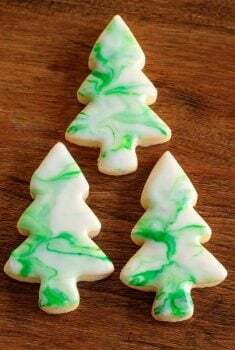 We especially like it with smoked cheddar, but it’s also delicious with Havarti, Gouda, Fontina, Comte, Gorgonzola, hard goat cheese… For a really special treat, serve it on a cheese board with these Copycat Rosemary Pecan Rainforest Crackers. Spread it on Brie, then wrap the round with phyllo or puff pastry. Bake until golden and cheese is gooey. Spread warm cornbread with butter and a spoonful of pepper jelly. Use this Pineapple Habanero Pepper Jelly as a glaze for roasted pork tenderloin. Make a grilled ham and cheese with a spread of Pineapple Habanero Pepper Jelly between the layers, yum! Season salmon with salt and pepper, then add a layer of pepper jelly. Broil until done. Use it for a salad dressing. 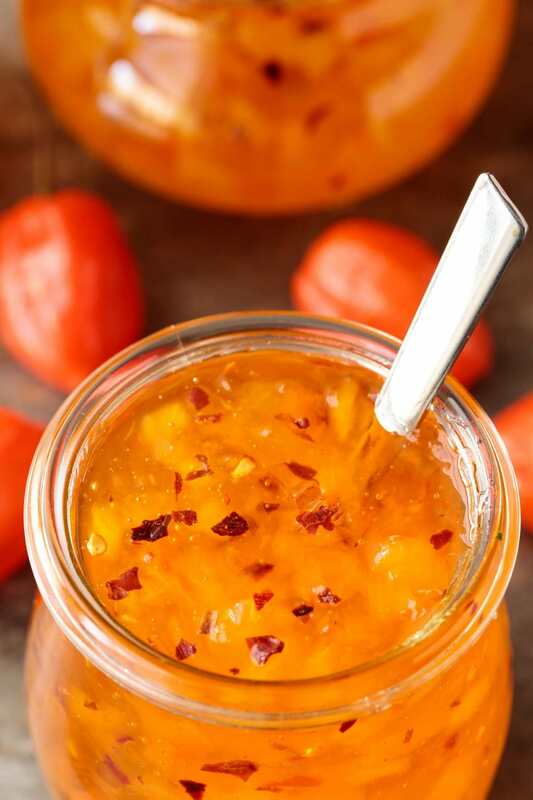 Mix equal amounts of grainy or Dijon mustard with this Pineapple Habanero Pepper Jelly for a delicious dipping sauce. Use it for a sweet and sour stir-fry. Saute garlic and ginger in a splash of oil then add thinly sliced chicken breast. Stir-fry for a few minutes until chicken is almost cooked. Remove chicken with a slotted spoon and stir-fry veggies. Return chicken to the pan, add a generous scoop of Pineapple Habanero Pepper Jelly, a tablespoon of rice vinegar and soy sauce, to taste. Serve with rice and a sprinkle of cashews. 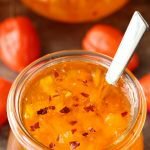 For a super fun and gourmet PB&J substitute this Pineapple Habanero Pepper Jelly instead of regular jelly! Making this Pineapple Habanero Pepper Jelly is not difficult. Once you’ve got the pineapple and peppers diced, it’s simply a matter of combining them with rice vinegar in a large pot. Next, the mixture is brought to a boil and boiled for two minutes after adding sugar and liquid pectin (see tips below). That’s it, just spoon it into jars and you’re done! Pick up a pineapple, a few habaneros, an orange bell pepper and a box of Certo next time you’re grocery shopping. 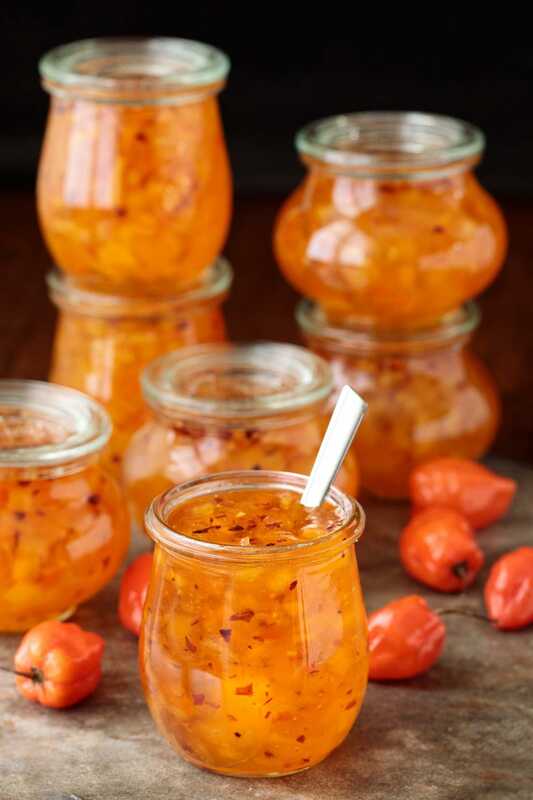 Give this Pineapple Habanero Pepper Jelly recipe a try. Whether you’re or long time jam/jelly maker or you’ve never attempted it, I think you’ll be thrilled with the results! This recipe calls for Certo. Certo is a liquid pectin that is available at most larger grocery stores. You’ll find it with other canning products, but I’ve found that it varies from store to store, in regards to where it’s located. 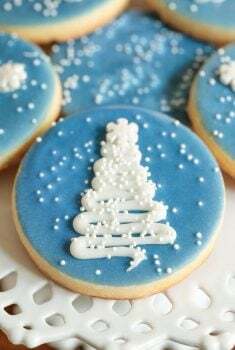 Some stores stock it in the baking aisle while others display it near the plastic wraps and food storage bags. An employee will be able to direct you to the right place. You can also find it online. Habanero peppers are very hot, ranging from 100,00 to 300,000 on the Scoville Heat Scale. Jalapenos, in comparison, fall into the 2,500 to 8,000 range. Habaneros can also vary in heat from pepper to pepper, so be cautious with how many you use, depending on your heat tolerance. I like to start with one or two and then taste the jelly before the final two minutes of boiling. You can always add more at this point, but you can’t take away the heat! Jam and jelly making is an exact science. Measure the ingredients carefully and, for good results, don’t try to adjust amounts. The jelly won’t look thick enough at first. It needs to set at room temperature for 24 hours and will thicken as it sets. A wide-mouth funnel is very helpful when making jam and jelly. It makes transferring the mixture from the pot to jars super easy and mess-free. I love these Weck Tulip Jars for jams and jelly, especially if I’m giving it as a gift. Feel free to use the hot water canning method with this Pineapple Habanero Pepper Jelly if you prefer. Here is a step by step instruction guide from Ball/Kerr. Sweet and spicy, this Pineapple Habanero Pepper Jelly is delicious with cheese and makes a wonderful grilling glaze for poultry, seafood and pork. Place finely chopped habaneros, bell pepper, pineapple and crushed red pepper flakes in a large pot. Add vinegar and bring to a boil. Boil for 2 minutes. Add Certo and bring to a rolling boil. Cook for 2 minutes, stirring continuously. Remove pot from heat and skim off any foam on the surface. Cover with lids and allow the jelly to sit for 24 hours, then place in freezer. If using hot water bath method, cover jars and immediately proceed with water bath canning method. Jelly may take 24 hours to set. See Café tips for more detailed instructions and extra tips. Recipe adapted from Genius Kitchen. Makes 48 ounces of jam. The Weck Tulip jars (shown above in the post) are 6-ounce jars so that would make 8 6-ounce jars of jelly. Between the sugar and the pineapple, there is enough sweet to eliminate any heat even with 3 large peppers. Has anyone modified this recipe to get some heat? After dicing everything. We weren’t able to make the jelly right away and there is quite a bit of juice. Should we drain any of the juice off? Yes, I would drain off the juice. Otherwise, you’ll have more liquid than what’s needed. I put all my ingredients in the food processor to get a fine chop. That produced juice but that liquid would be held by the fruit regardless. I did not drain. I have made the jelly twice and it is delicious but it is not as thick as store bought jelly. Is this jelly supposed to be a bit looser than store bought? I followed the directions exactly and poured it into small jars and let it cool down then put them in the refrigerator and even after 2-3 days it is not as thick as store bought. Hi Patricia, this jelly is a bit looser than store-bought. I think they use more pectin in theirs but we live that this jelly is not so stiff. If you like yours thicker, you could add a little more pectin. I can’t say exactly how much as I haven’t tried it. I prefer low or no sugar pectin to the liquid pectin called for in this recipe. My jelly turned out with a full set and not runny. Wonderful! Thanks for sharing your results, Dave! Why does these need to be frozen? Hi Sara, it doesn’t have to be frozen if you are going to use it all within a couple of weeks. Then it will be fine in the refrigerator. Freezing is just a way to keep it for a longer period of time. You could also use the traditional method of canning with a hot water bath. Can I use canned crashed pineapple instead of fresh one ? Yes, just drain it before using. I made this and it was delicious and my first time ever making a jelly!! Can I possibly use strawberries instead of pineapple for a batch ? Hi Rachel, I’m so happy you had such great results! In answer to your question, jam and jelly making can be a little bit tricky if you try substituting ingredients. Strawberries have more water than pineapple so I couldn’t tell you without testing how many to use. Rachel, all fruit has its own level of natural pectin. Strawberries are low in pectin. When I make strawberry jam, I use Sure-Jell low or no sugar pectin along with the specified amount of sugar and it always sets correctly. Could I possible use different fruit like strawberries? 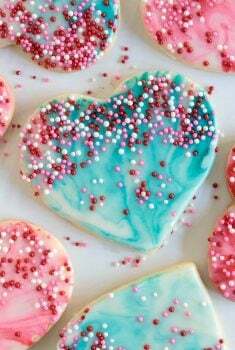 I didn’t make this recipe and it was amazing! By the way!! 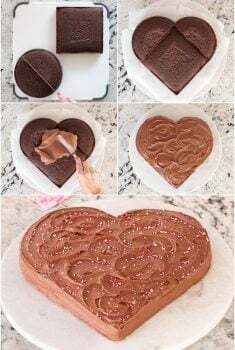 Hi Mandie, you would actually use a different recipe with SureJell. I would check on the Kraft website for this.